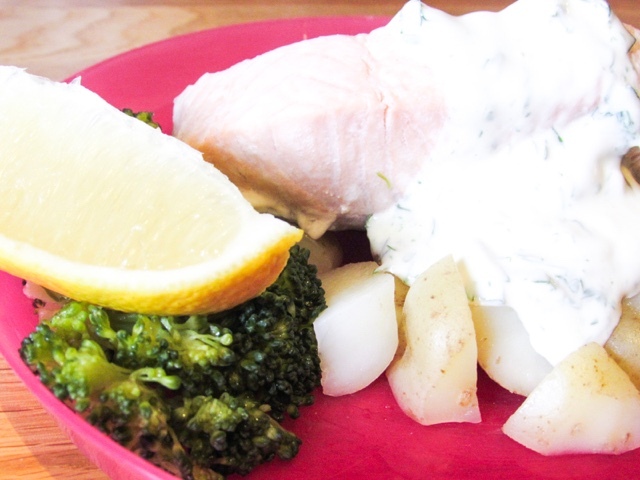 Life as a family of four is busy at the best of times, so cooking fresh, healthy meals isn't always easy. This is made even more complicated due to the fact that my husband eats meat, I'm a vegetarian, Isabella is a toddler needing low sugar/salt and Poppy is about to start weaning. That's up to four different meals that need cooking, so finding tips and tricks to make life easier is important. 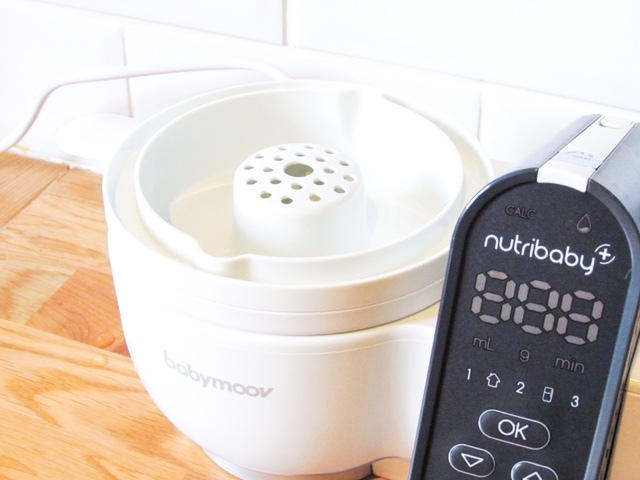 Babymoov have recently launched a product that does exactly that, meet the Nutribaby(+)* (£139.99). 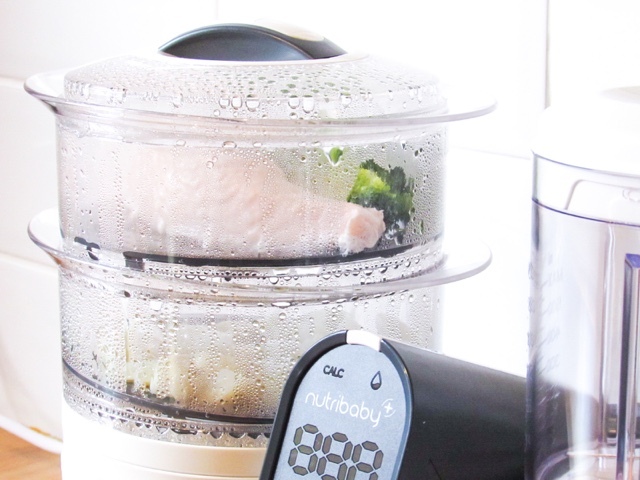 An easy-to-use kitchen appliance that makes cooking food for the whole family a whole lot easier! 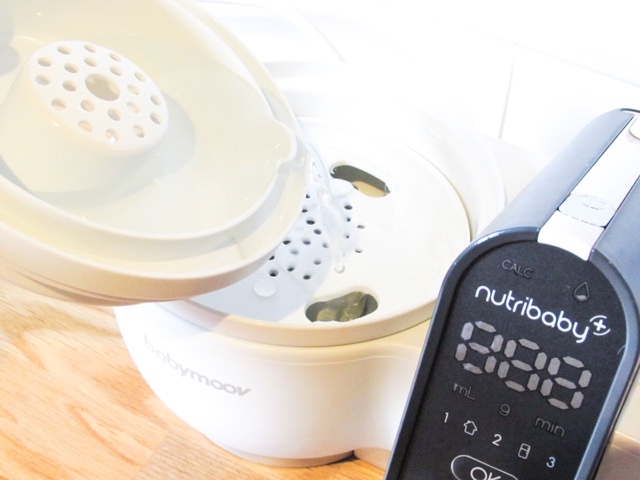 This four-in-one device can blend, steam, sterilise and warm up bottles, allowing parents to create nutritious meals with minimal effort and time. The compact design also means it doesn't take up much space on your kitchen counter, yet the XXL capacity still allows you to cook for the whole family. 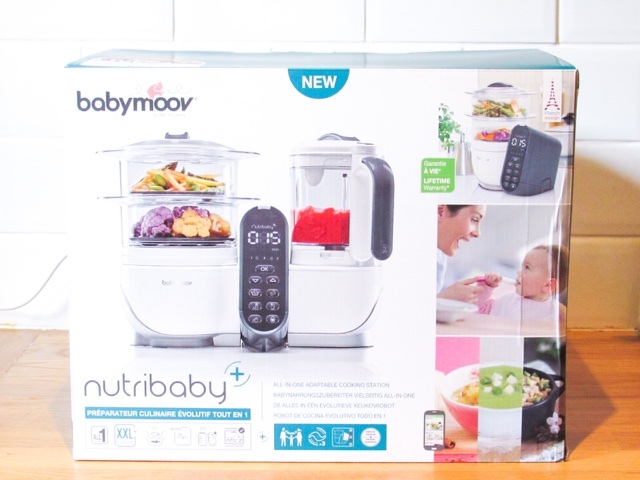 As a parent to both a toddler and weaning baby I have found having the steamer and blender together so convenient because it allows me to cook Isabella a meal whilst blending up purees for Poppy. At the moment I'm trying to fill the freezer with homemade purees in readiness, so being able to make some at the same time as cooking Isabella's dinner saves a lot of time. 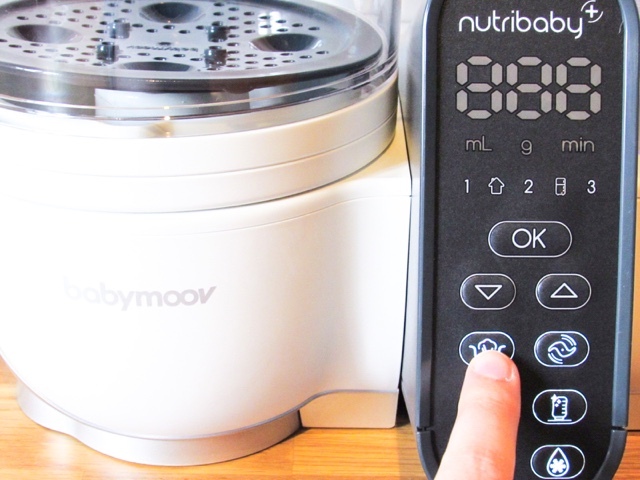 The Nutribaby(+) has three blending speeds, which allows you to create exactly the texture you desire. This is so helpful for the weaning process, as babies start with smooth purees and then develop onto more textured purees. 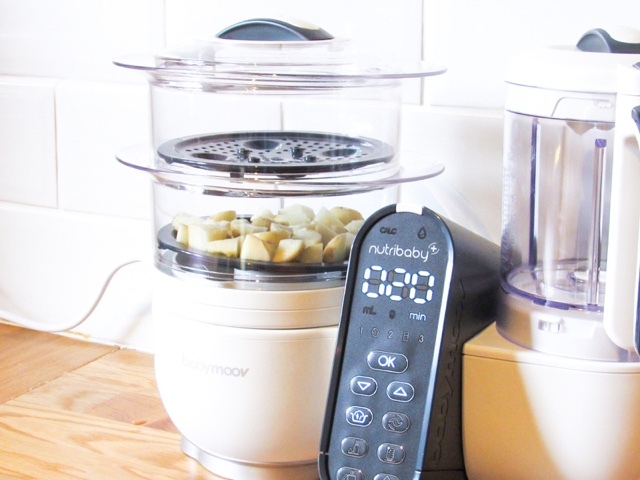 This feature is also ideal when blending up homemade soups and sauces for the whole family. A really quick way of cooking up a nutritious soup is to steam a bag of prepared fresh vegetable soup (available in supermarkets), transfer to the blender, add some low salt stock and blend. A hearty, warming soup filled with goodness that is ready in less than 15 minutes! Steaming is one of the best ways to cook food because it helps to retain the nutrients, so the large capacity steamer is ideal for using with the whole family. If you are or planning to do baby-led weaning then steaming sticks of vegetables is a really quick and convenient way of allowing your child to explore different food/texture. 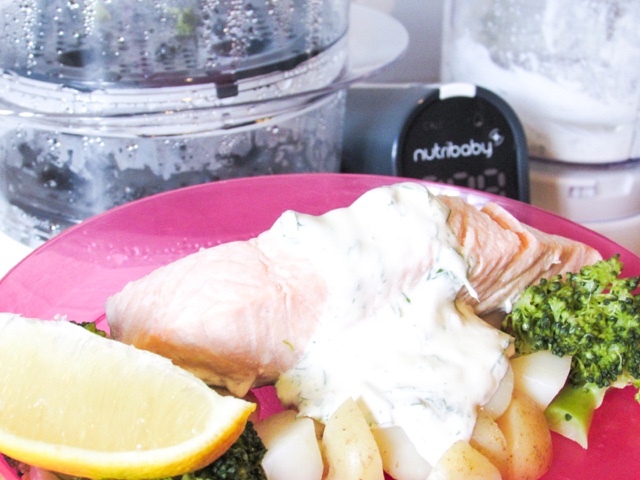 A really simple yet filling toddler/adult friendly meal that Isabella has been loving having is a fillet of salmon, boiled new potatoes, broccoli with a crème fraiche and parsley sauce; all made in the Nutribaby(+). 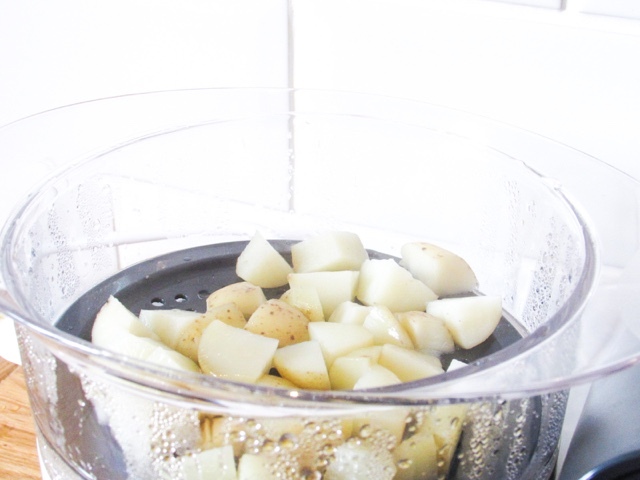 As the potatoes take slightly longer to cook I place those in the bottom half of the steamer first, set the easy-to-use timer to 20 minutes and press cook. At about 16 minutes left I'll pop the small salmon fillet on the top shelf and finally add the broccoli with 10 minute left to go. That way all of the food is ready at the same time and there's no impatient toddler waiting around! 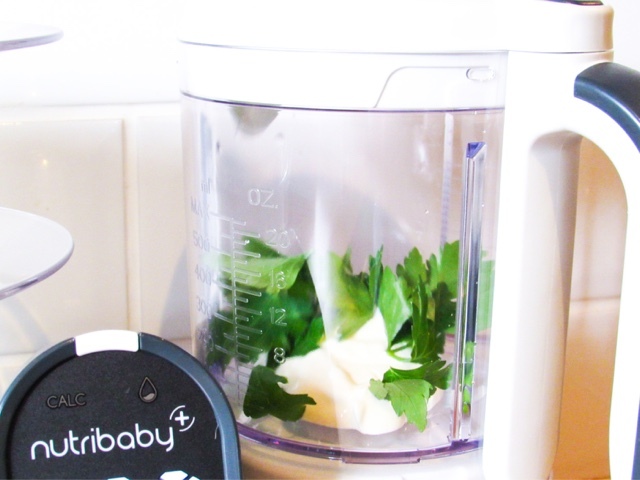 When there I only a minute or so left on the timer I pop crème fraiche, lemon zest and fresh parsley into the blender and pulse. 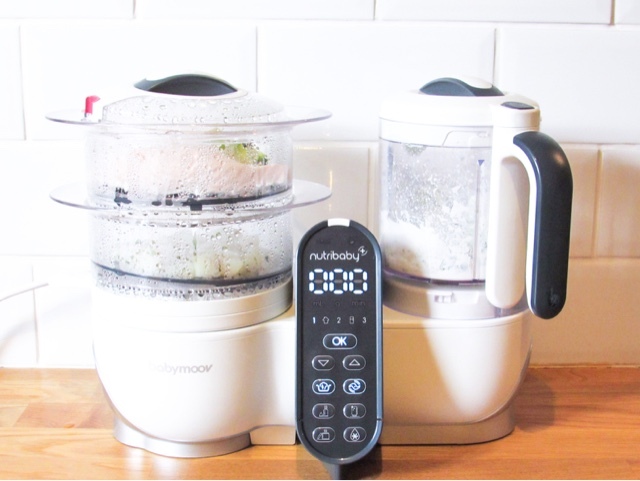 The timer will beep when the food I ready, which is really handy because it mean you don't have to keep looking at it to check. In 20 minutes Isabella can enjoy a hot meal, cooked from scratch and if I have enough broccoli I've also been cooking extra, rinsing out the blender and then blending it up into a puree for Poppy when she start weaning. So convenient and such a time saver! 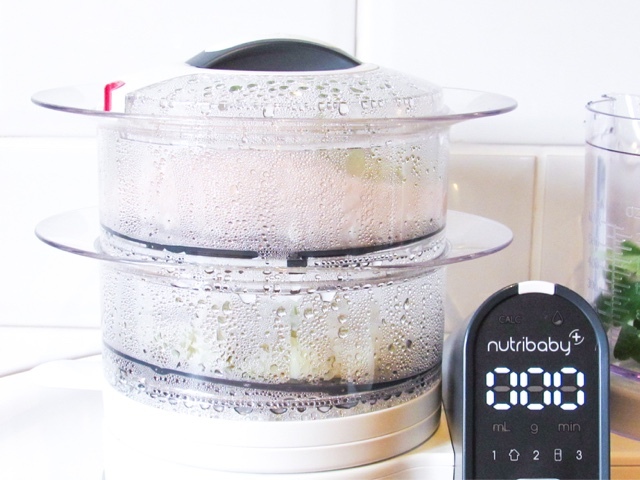 You can also use the steam section to defrost food or sterilise bottle/dummies/teethers. One really good tip they suggest is to reserve the cooking water from the steamer to thin down purees or add to soups etc. 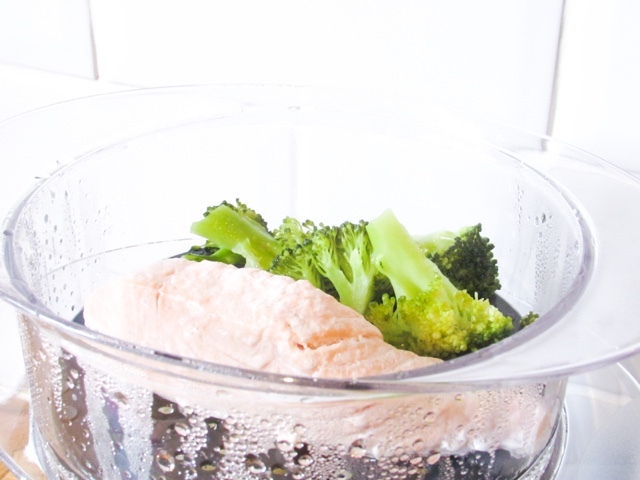 The cooking water is filled with the vitamins and minerals from the food you've steamed, so it is an easy to add them back into the food you eat. 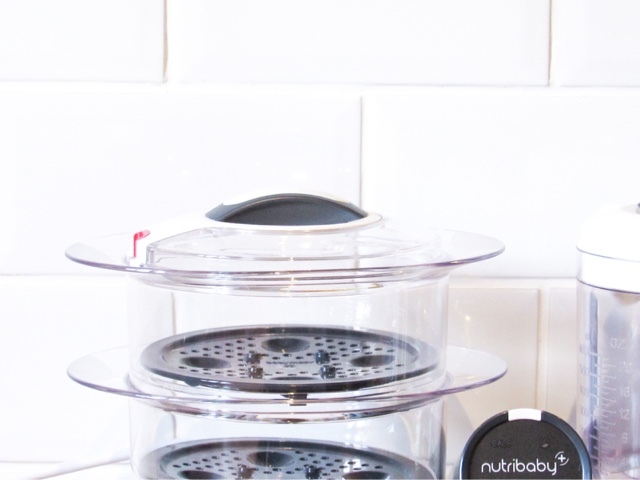 The Nutribaby(+) is available in Soft White or Industrial Grey and you can buy additional coloured shells to further match it to your kitchen décor. What are your top tips for making cooking for the family easier? I'm linking this post up with That Friday Linky. 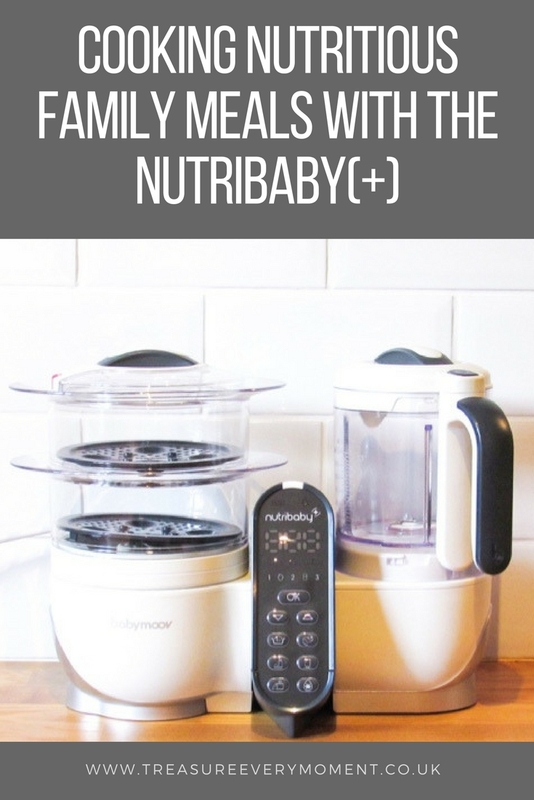 This looks like a great piece of kit and I love the fact that you can also use it to steam and sterilize how perfect for households with little mouths to feed! I love this and in need of this, perfect that it has loads of stacking steamers and great not for the kids, but us big ones too. Oh wow I need this in my life!! We are always having to cook different meals for the six of us, this would be ideal! That looks like a seriously handy appliance! I really could have used something like that when I was cooking for babies. I love the sound of this gadget. Looks really handy. I'd never heard of this gadget before. We wouldn't have space for it in our small kitchen, but it sounds great! Wow! 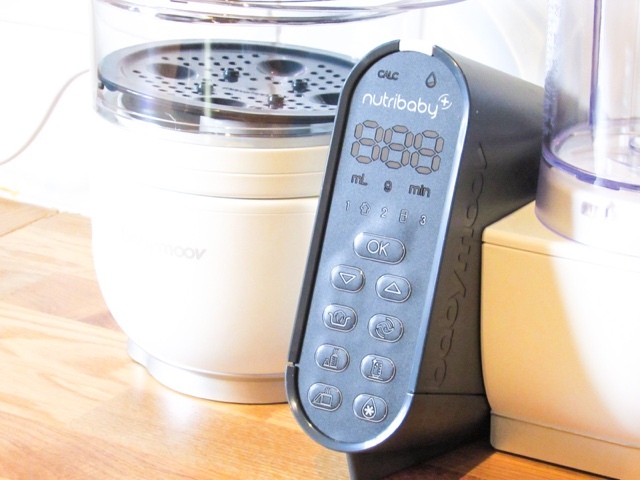 I wish the Nutribaby had been around when I was weaning! Looks like I would have really got some things made if I'd had it. 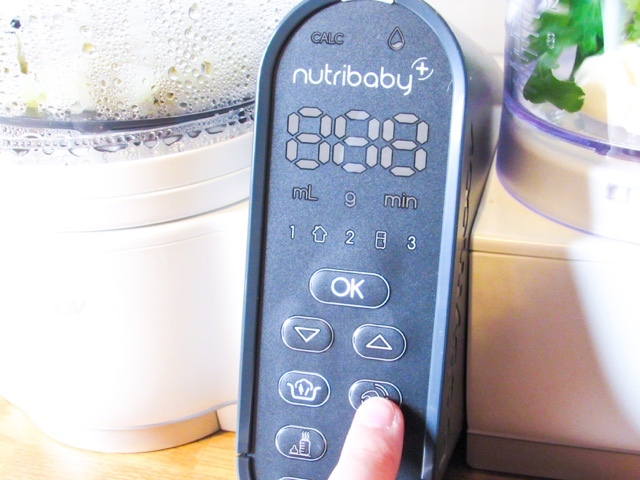 I definitely need me one of these, like how did I not know about nutribaby!! This looks like a big help in the kitchen. I'm thinking of getting one. This looks so good. I can't believe you're having to think about weaning already. It's flown by!! This looks like a great bit of kit! Steaming is such a healthy method of cooking. Thanks for sharing.